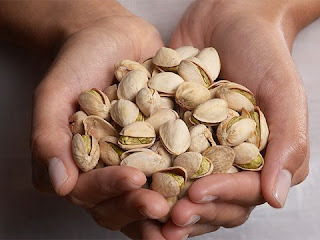 On paper, a handful of pistachios doesn't seem the smartest choice if you’re looking to shed pounds. Nuts are fat-packed calorie factories, so best stick to the green stuff, right? Far from it. A new study, published in the journal PLOS One, is the latest to discover the health benefits of the Christmas staple. Researchers found nut eaters are around 40% less likely to be obese than those who steer clear. Which expains why you've never seen a chubby squirrel. As well as a more streamlined waistline, the study found snacking on tree nuts is linked to reduced rates of diabetes and heart disease. The theory is that though nuts are fatty, they contain what's called high-density lipoprotein, aka 'good' cholesterol, which helps counter the artery-clogging impact of low-density lipoproteins – the 'bad' cholesterol that’s inside your sirloin. You’re unlikely to see much benefit from downing a bag of dry-roasted in the boozer, but scoffing a handful of unsalted nuts every morning is one of the best and easiest new year habits to acquire. Or you could get your fill with these heart-protecting recipes. You’d be nuts not to.